I am FINALLY at my FIRST Grace Hopper Conference! I am getting super excited as I walk around to register, pick up badges and get my registration bag, full of swag (shhhh, I don’t want to ruin the surprise for everyone, so I am not posting the pic of all the NEAT swag in the registration bag….at a later time). 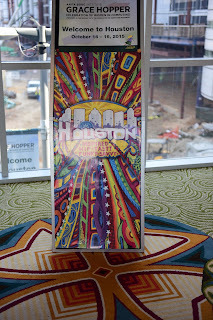 This was one of the beautiful standing banners going from the Hilton Americas to the George R. Brown Convention Center. I love the colors and it immediately grabbed my attention. I am actually one of those people who pay BIG attention to businesses who sponsor/support the organizations I am in and/or conferences I attend, ESPECIALLY the ones geared towards women in tech and women of color in tech. 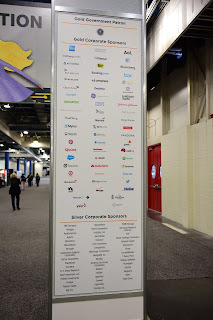 THANK YOU to this great list of sponsors! WHAT are you all building/doing to downtown that ENTIRE STREETS are dug up and there is either ONE lane or NO lanes (completely blocked off)? It looks like armageddon around the convention center! LOL! I know, I know, you all are preparing the city for BIGGER and BETTER (they say everything is bigger in TEXAS, so we’ll see!). 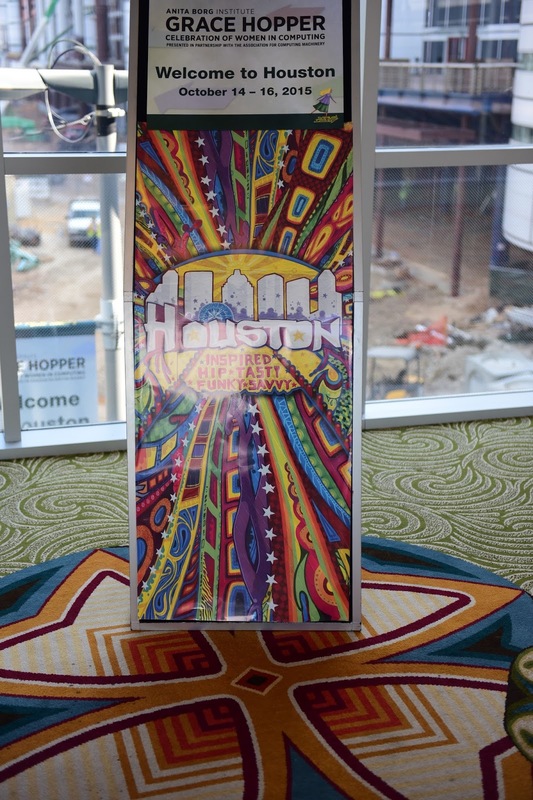 Lastly, THANK YOU , Houston, for all of the friendly faces and smiles greeting us at registration and in the hotels! Southern hospitality is flowing strong around here today!